Does Brooklyn Today Still Have Italian Neighborhoods? Historically, Brooklyn had many predominantly Italian neighborhoods. However, does contemporary Brooklyn still have largely Italian enclaves, with ethnic Italian restaurants, Italian bakeries and Italian food stores? Yes, but in recent years these neighborhoods have transformed and have become home to an array of people from around the world. Yet, these areas still pay tribute to their once Italian immigrant roots, with cafes and restaurants dotting the main streets, as well as annual festivals. Enjoy traveling around these four Italian Brooklyn neighborhoods. From old school pizzerias to cafes serving Italian pastries, you will find lots of Italian inspired treats in Brooklyn. If you are a pizza lover, considering taking a DIY pizza tour of the borough with this list of Brooklyn's best slices of pizza. 1. Bensonhurst remains Brooklyn's most "Italian" neighborhood. Bensonhurst is no longer predominantly Italian, as it was in the 1980s and 1990s. Today a large immigrant Asian population lives in Bensonhurst, along with other people affiliated with other religious and ethnic groups. You can still find some great Italian markets and restaurants. Highlights include D. Coluccio & Sons, a popular Italian market and Ortobello's, an Italian restaurant on Bay Parkway. Fans of the flick Saturday Night Fever, might enjoy a slice at Lenny's Pizza on 86th Street, which was the setting for a few scenes in the film. 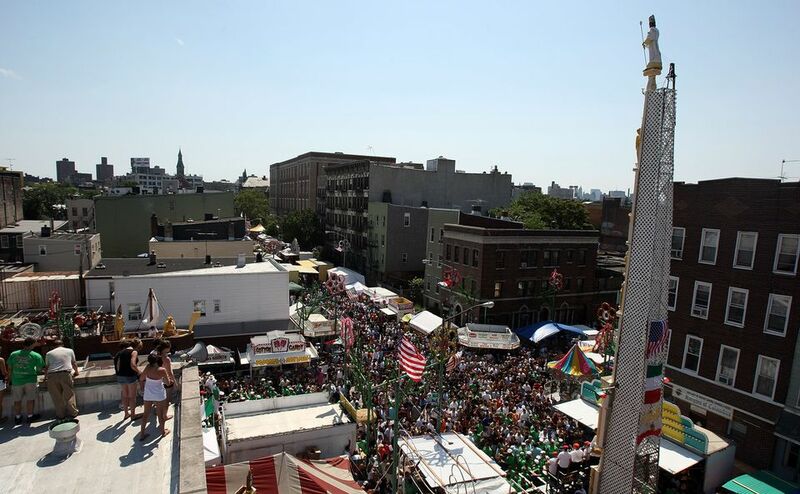 If you want an authentic Sicilian celebration, for over forty years, each August, Bensonhurst hosts the Feast of Santa Rosalia, The ten day celebration which includes carnival rides and fantastic food is not to be missed. 2. Dyker Heights, a residential community adjacent to Bensonhurst, also has a strong Italian presence. Dyker Heights is well known for extravagant displays of Christmas lights in December. Although it swells with tourists during the holiday season, snapping pictures of the incredible light displays, it is also a year round destination. If you plan a visit to Dyker Heights, you should definitely arrive on an empty stomach. Restaurants and markets abound in Dyker Heights. Highlights include L & B Spumoni Garden, where you should order a square slice and spumoni. Or head to Mama Rao's for a meal at this local favorite restaurant. Bring home some Italian food to cook at home from La Bella Marketplace, this local Italian market has been a local favorite for decades. 3.Williamsburg has for a century been home to Brooklyn's July San Genario festival, organized by Our Lady of Mount Carmel Church. Sections of this sprawling swath of Brooklyn remain ethnically Italian, and visitors can enjoy some remarkable old-world southern Italian-style restaurants. However, Williamsburg has become a very diverse area with a mix of 20-something college grads, artists, Hasidim, and others. If you'd like to have an old school Italian meal in a classic restaurant, head to Bamonte's on Withers Street. This notable restaurant has been serving classic Italian comfort food dishes for over a century and is one of the oldest restaurants in New York City. 4. Carroll Gardens and Red Hook, once very much associated with Italian longshoremen and long an Italian enclave, are today quite gentrified. This area was also the setting for the 1980's film, Moonstruck. The Italian influence on these adjacent neighborhoods can be seen in a few old-school red-sauce Italian restaurants, and in patterns of local real estate ownership. The area is also home to numerous Italian bakeries, offering everything from fresh bread to pastries. Stop by either Caputo's or Mazzola Bakery for bread. For a nice cappuccino and a pastry, head to Monteleone's. Or pick up cookies, cheesecake, and pastries at the Court Street Pasty Shop. However in recent years Carroll Gardens has become home to young families. Don't worry, you will be able to score some authentic Italian food here. As you stool through the neighborhood, you'll find many Italian and Sicilian social clubs, but they're not open to the public. The only social club you can enter is Brooklyn Social, a bar housed in the former Society Riposte, a Sicilian social club.